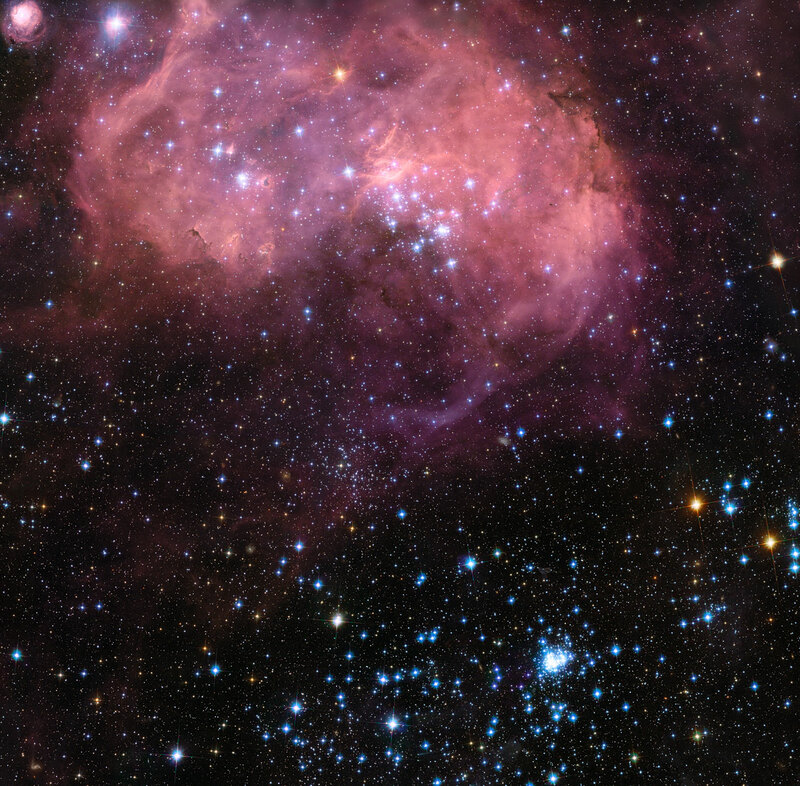 The Large Magellanic Cloud contains many bright bubbles of glowing gas. One of the largest and most spectacular has the name LHA 120-N 11, from its listing in a catalogue compiled by the American astronomer and astronaut Karl Henize in 1956, and is informally known as N11. Close up, the billowing pink clouds of glowing gas make N11 resemble a puffy swirl of fairground candy floss. From further away, its distinctive overall shape led some observers to nickname it the Bean Nebula. The dramatic and colourful features visible in the nebula are the telltale signs of star formation. N11 is a well-studied region that extends over 1000 light-years. It is the second largest star-forming region within the Large Magellanic Cloud and has produced some of the most massive stars known. It is the process of star formation that gives N11 its distinctive look. 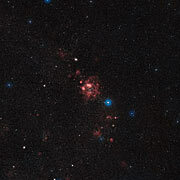 Three successive generations of stars, each of which formed further away from the centre of the nebula than the last, have created shells of gas and dust. These shells were blown away from the newborn stars in the turmoil of their energetic birth and early life, creating the ring shapes so prominent in this image. Beans are not the only terrestrial shapes to be found in this spectacular high resolution image from the NASA/ESA Hubble Space Telescope. 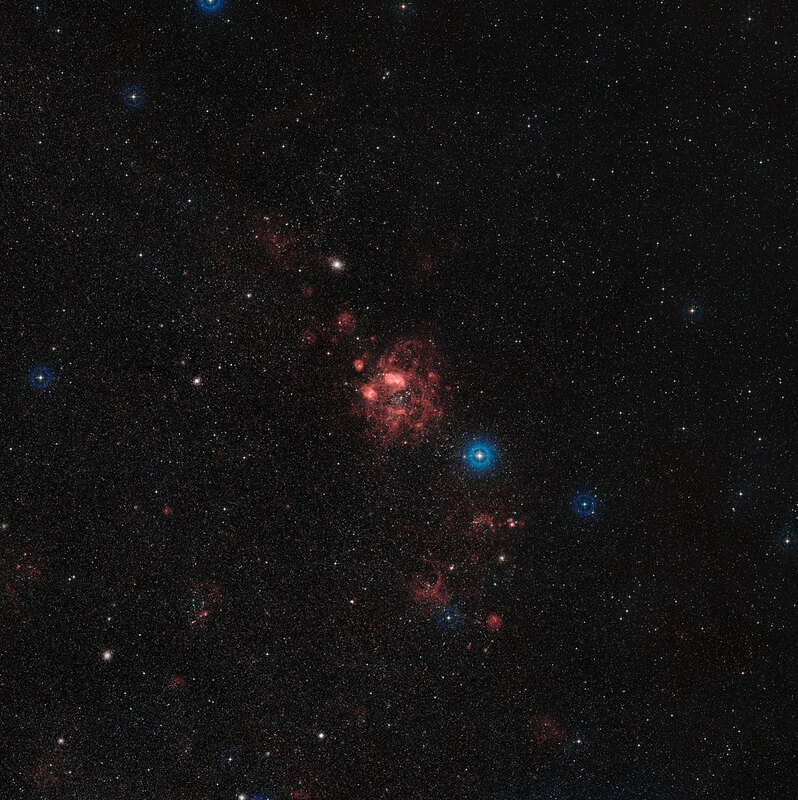 In the upper left is the red bloom of nebula LHA 120-N 11A. Its rose-like petals of gas and dust are illuminated from within, thanks to the radiation from the massive hot stars at its centre. 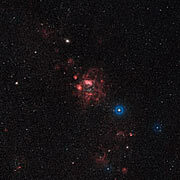 N11A is relatively compact and dense and is the site of the most recent burst of star development in the region. Other star clusters abound in N11, including NGC 1761 at the bottom of the image, which is a group of massive hot young stars busily pouring intense ultraviolet radiation out into space. 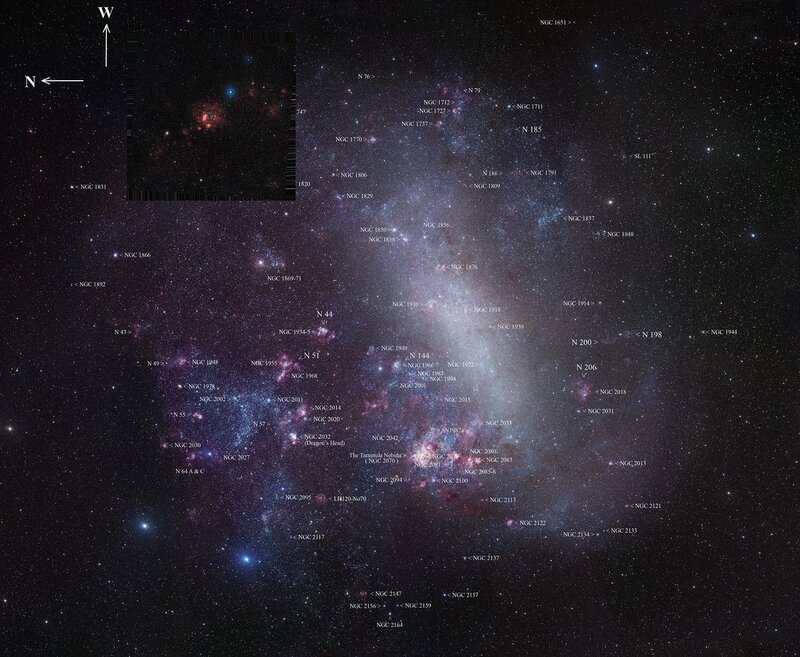 Although it is much smaller than our own galaxy, the Large Magellanic Cloud is a very vigorous region of star formation. 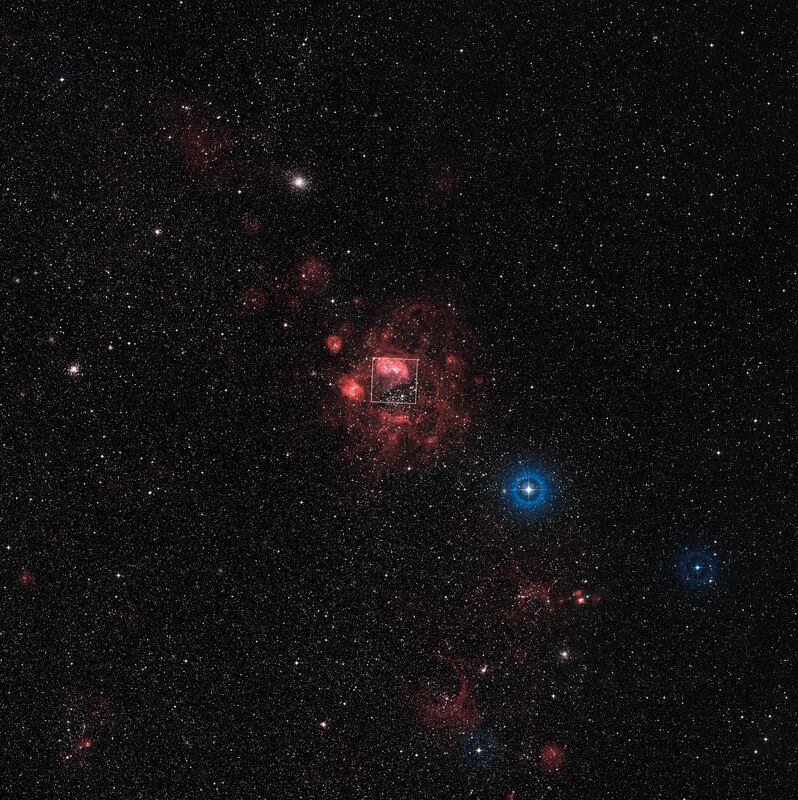 Studying these stellar nurseries helps astronomers understand a lot more about how stars are born and their ultimate development and lifespan. 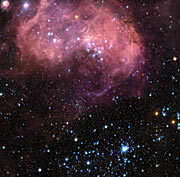 Both the Large Magellanic Cloud and its small companion, the Small Magellanic Cloud, are easily seen with the unaided eye and have always been familiar to people living in the southern hemisphere. The credit for bringing these galaxies to the attention of Europeans is usually given to Portuguese explorer Fernando de Magellan and his crew, who viewed it on their 1519 sea voyage. However, the Persian astronomer Abd Al-Rahman Al Sufi and the Italian explorer Amerigo Vespucci recorded the Large Magellanic Cloud in 964 and 1503 respectively.